Enrichment – it’s a popular concept in pet care today. As pet parents, we know that enrichment is valuable and can help us provide the best quality of life to our pets….but what is it, really? 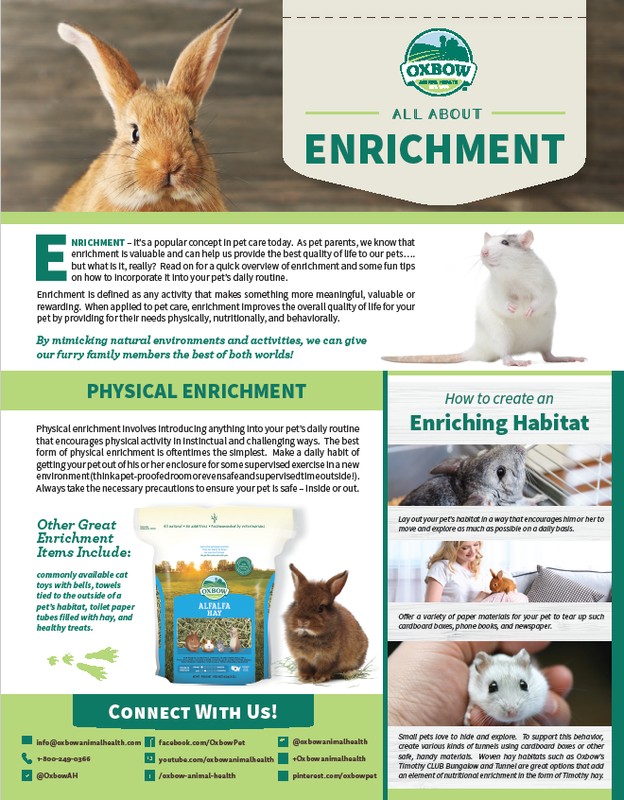 Download our All About Enrichment guide for a quick overview of enrichment and some fun tips on how to incorporate it into your pet’s daily routine. 2. Provide different toys and accessories in your pet's environment to engage and interact with, such as a Timothy Club Bungalow! Balancing Act - Holding a treat high enough above his head to make him stretch to reach it. Gradually increase the height until your furry friend perfects his balancing act! Provide different toys and accessories in your pet's environment to engage and interact with, such as a Timothy Club Bungalow! 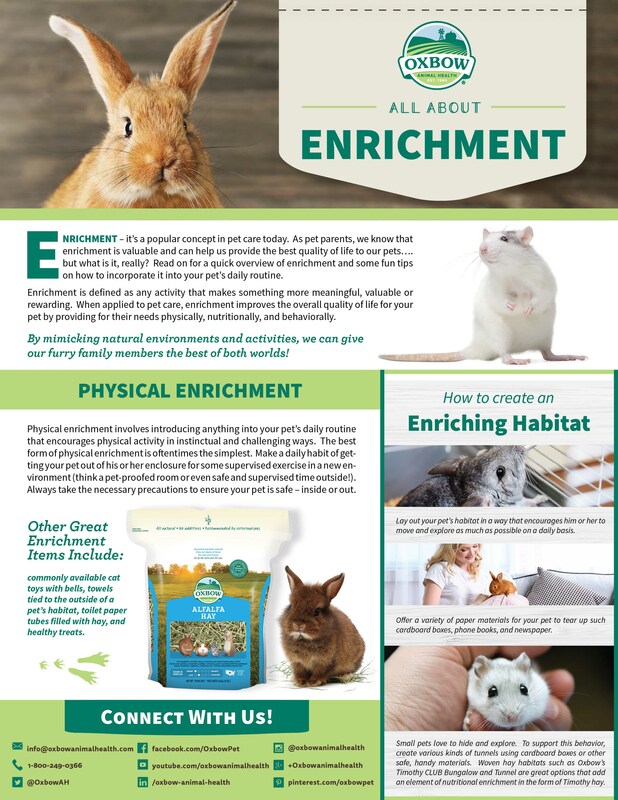 Games With Pets - New Enrichment Handout! Playing games with your pet is a wonderful way to stimulate natural behaviors, encourage exercise, reduce boredom, and increase that special bond between pet and pet caretaker. 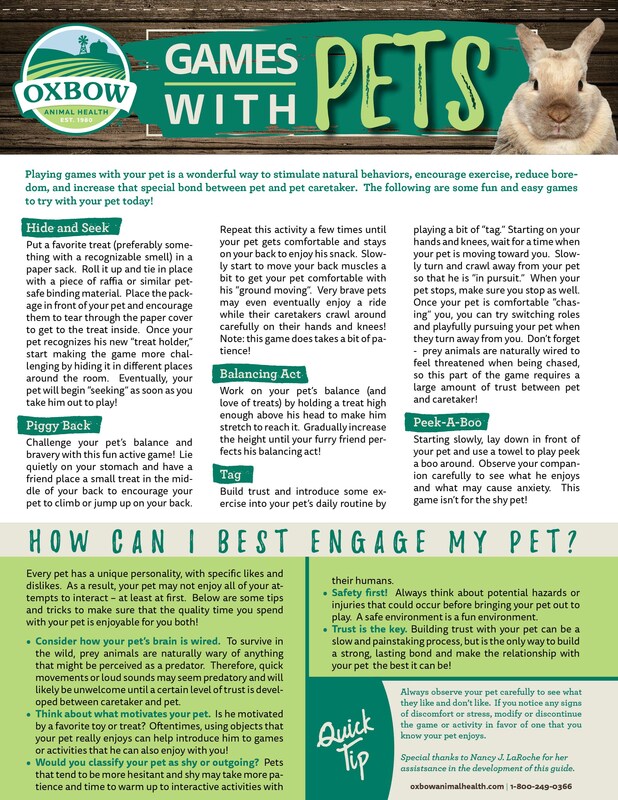 Download our Games With Pets handout for some fun and easy games to try with your pet today! Murdock, NE, September 13, 2017-- Oxbow Animal Health has announced the winners of its “Sharing Our Garden” rescue donation campaign. A portion of all sales of Garden Select foods made in July and August were donated to support rescues in need. The five winning groups will each receive $1,000 to support their organization’s needs. 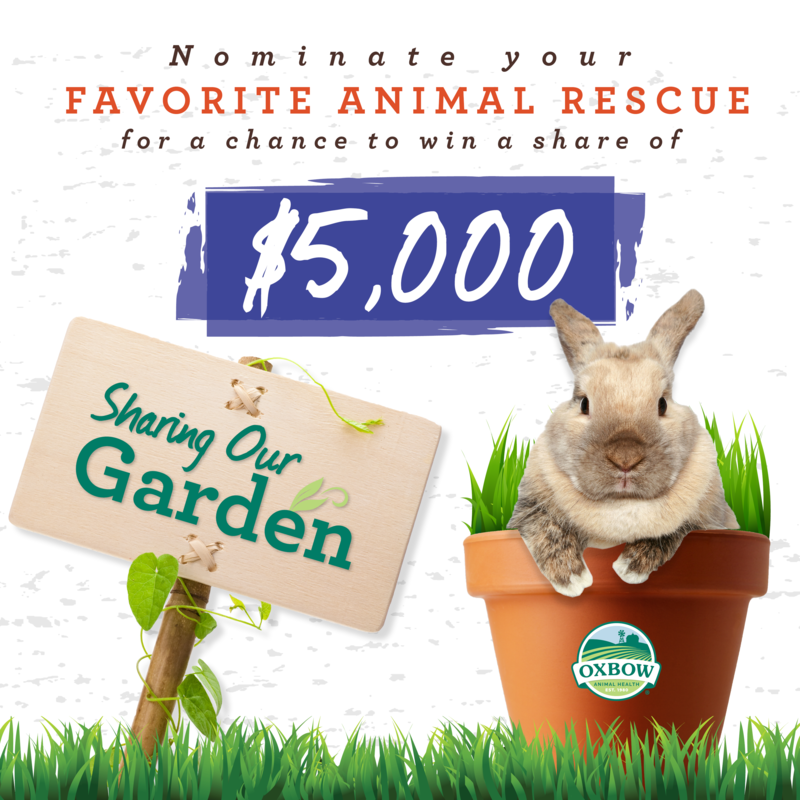 Winning organizations were chosen via public voting on the “Sharing Our Garden” campaign page. In addition, Oxbow has announced an additional $1,000 award to the Houston SPCA to support area animals in the wake of Hurricane Harvey. Oxbow Animal Health is a worldwide supplier of premium life-staged foods and supportive care products for small exotic animals. Used and recommended by top exotic animal veterinarians worldwide, Oxbow offers an extensive line of superior quality, high-fiber hay, fortified foods, treats and supplements for rabbits, guinea pigs, chinchillas, hamsters and adult pet rats. Oxbow’s mission is to provide superior-quality food and forage products for specialized animal markets.